While we're busy adding presentation-building features, we thought we'd share some helpful hints and workarounds. 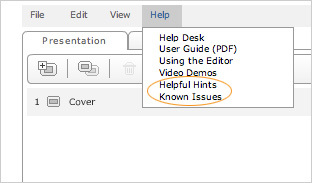 You'll find the Hints located under the Help menu in the Editor. The Known Issues are posted here as well. If you discover any workarounds you frequently use while making presentations, please share them with us! We'll keep updating (and deleting) from this list as new features become available. We were having a minor problem with registration for about an hour yesterday. If you haven't yet registered, please try again. Thanks.